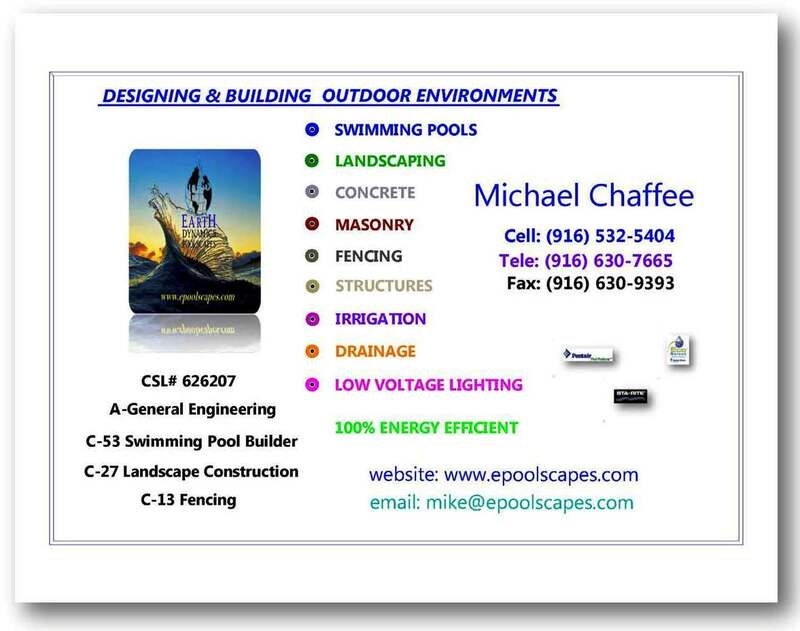 ePoolscapes.com is a proven El Dorado Hills industry leader, with over 35 years experience pouring, setting, designing and installing concrete flat-work, patios, driveways, decking, stairs, cantilever edge, swimming pool decking and many other challenging / creative El Dorado Hills concrete applications. We service Southern and Northern California areas, including El Dorado Hills. For more information, or to contact us regarding work, please call us or use the contact form on the right-hand side to get in touch with us, or call us directly at the number listed at the top of every page. 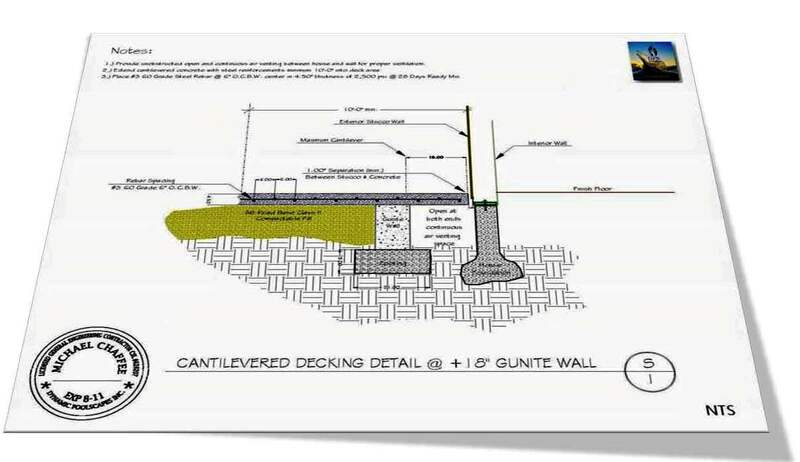 Please take a few minutes and view the video presentation below about our approach to providing El Dorado Hills concrete construction. We provide superior quality work at extremely competitive prices and always deliver as promised and on-schedule. We provide top quality concrete and masonry construction, and our masonry can complement our El Dorado Hills “style” swimming pool designs! When we are called upon to estimate your El Dorado Hills concrete repair, new installation or overlay project, we are fully cognizant of what goes into a successful result, having been there a thousand time before! Considerations must involve making assessments for pumping, wheeling and or other delivery systems necessary to access obscure site locations. Additionally, preparations based upon a pre-site analysis will have allowed us to fully gauge your El Dorado Hills project to see if there are any special requirements so that we can improve the situational performances. We can provide help with the smallest jobs through the most complex relating to services and specialty finishing techniques. We also install El Dorado Hills concrete counter-tops with special structural reinforcements and load design strengthening upgrades. Pouring concrete is nothing without design. 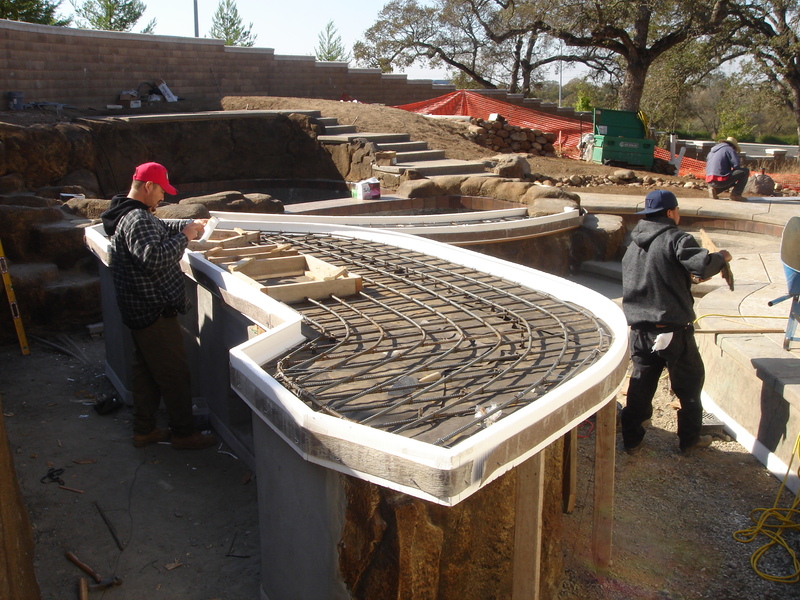 Our El Dorado Hills concrete design team works to create a unique concrete design, ranging from driveways to walkways, from slabs and blocks to foundations. We work with you to build a CAD file, ready to demonstrate the full scope of your concrete construction project, yards wide and many layers deep! We provide all the services from conceptual design to layout. 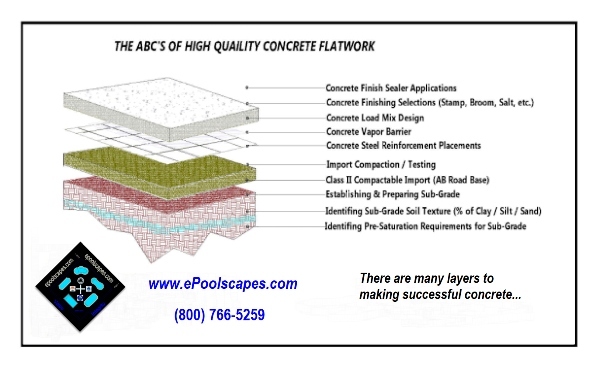 We can provide for all of your concrete needs in the El Dorado Hills area. We provide all the El Dorado Hills concrete services necessary for getting your property ready, from sub-grading to applying a lasting coat of sealer. 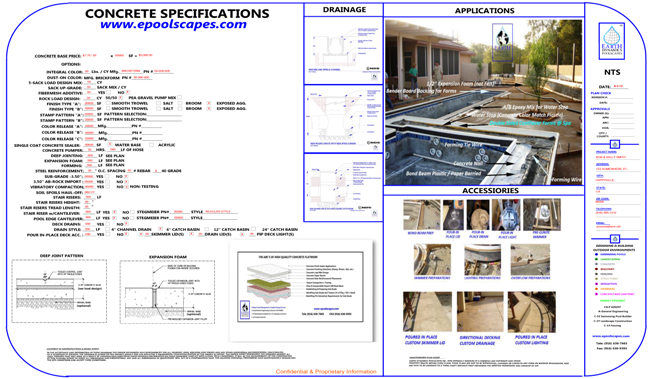 ePoolscapes.com can provide complete El Dorado Hills demolition and concrete removal services also. We can also provide wet stamped El Dorado Hills construction details involving the engineered steel reinforcement configurations for the structural requirements together with providing for a steel reinforced schedule for structures, stairways, walkways, driveways and other concrete works providing the prescribed structural requirements. In the preparations, placement and performance of constructing El Dorado Hills concrete flat-work many contributing factors are involved. Depending upon your concrete specifications your El Dorado Hills concrete patio, concrete driveway, concrete tennis court or any other concrete surface will have a greater success if you have a defined specification in which to hold any performer accountable. Being a premiere concrete company has made us a recognized industry leader over the past 35 years.